Sunrise over Mt Kendall, photographed 3/18/15. 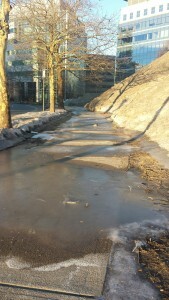 The glacial flows from Mt Kendall are a menace to pedestrians. Mt Kendall swallows everything in its path. 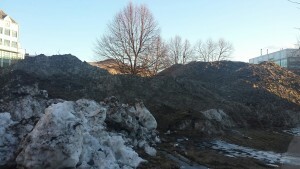 With all the snow in Boston this winter, several new mountain have formed out of desperation for places to put snow. Here are of few pictures of what I call Mt. Kendall. Since the first day of spring was last week, I wanted to document Mt. Kendall, which I pass each morning on the way to work. It has a vertical of about 30 ft, multiple peaks, and several glaciers. As the mountain melts, an interesting collection of show shovels, parking cones, bits of car bumpers, and other debris has begun to emerge. It might be interesting to take an ice core and study the strata from the different storms to learn about what people were doing last January. For some reason, the Kendall Square Diamond which was abandoned at this location several years ago was kindly moved to the side before the dumping began, and was spared the full wrath of Mt. Kendall. 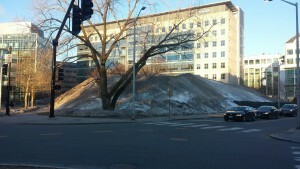 I have also heard reports of another mountain at the western edge of MIT that many have begun calling Mt. Cambridge-manjaro. It is supposed to be good for late-season sledding. Anyone want to guess when the last day I can find snow here is? My guess is the first week of June. We’re running out of bandwagons to jump on in Boston. I can’t say I watched more than a few regular season Celtics games this year, but Celtics did an amazing job of scrapping together a team of fighters that played good defense and got the job done. Watching them completely destroy the Lakers last night was amazing and seemed like a good way to win. There is no question that they were better. There was also the usual Boston-style post-championship rioting. Side note – does anyone know what Kevin Garnett is talking about in this post-game interview? It’s interesting that even though the Celtics are a historically successful team, you didn’t hear anything about them in Boston until part way through this season. I gues they hadn’t done much recently to get excited about and the Red Sox and Patriots were stealing all the attention. But I also wonder if the NBA has lost popularity. I haven’t really been an NBA fan since Jerry Reinsdorf’s destruction of the Bulls in 1999. I’ve tried, but now I just like baseball better. I can’t decide if the NBA was more popular and exciting during the 90’s or if my perception of the NBA’s popularity was skewed because I grew up in Chicago. 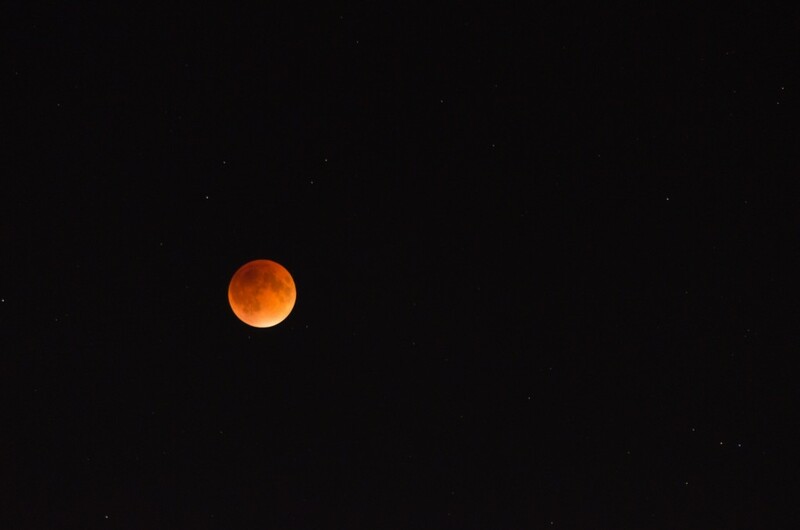 It seemed like everyone everywhere cared about basketball. There was the Dream Team, Jordan, Pippen, Brid, Magic, Ewing, Rodman, etc. Maybe the marketing machine behind Michael Jordan just can’t be matched. Maybe it was because the Bulls were the only good team in Chicago (well, the White Sox were ok, but there was the baseball strike). Maybe basketball was more popular.